Yasodhara Yoga teachers and centers are the teaching arm of a network of charitable organizations. Our centers are run by Karma Yogis, those offering their work as service to the students and the broader community. The classes we give and the work we do in our communities are not-for-profit. We are guided by the ideal of service and offer these yogic teachings without expectation of personal monetary gain. Fees and donations go directly back to operating costs or special projects at the centres. All of these organizations work with the Yasodhara Ashram Society on projects of mutual interest. The Friends of Radha Foundation (FRF) is a registered Canadian charity and BC Society with the purpose of establishing and operating teaching centres in urban areas in Canada. to support and cooperate with all persons, groups or organizations having similar, or concomitant, aims, views or objects. The Association for the Development of Human Potential (ADHP) is a US non-profit that has the purpose of advancing yoga-related research and the application of that research to modern life. The ADHP also oversees the teaching centers in the US. The ADHP is dedicated to inspiring people to discover a hidden potential within themselves. Swami Sivananda Radha founded the ADHP as a non-profit in 1970, out of gratitude for all the Americans who had supported her efforts to bring the ancient teachings of yoga to the West. The ADHP offers classes and workshops throughout the U.S., with its main hub in Spokane, Washington. As with other non-profit organizations, the ADHP is dependent upon the generosity of its members and friends. Donations are tax-deductible in accordance with applicable law and each contribution helps to make Swami Sivananda Radha’s teachings available to seekers everywhere. Additional financial and other information about the ADHP may be obtained from the secretary of Washington state’s office at 1-800-332-4483 and www.sos.wa.gov/charities. The Radha House Association is a registered charity in the UK that oversees Swami Radha’s teachings and centres in Europe. This charity supports the teachings of Yasodhara Yoga in Europe by helping teachers and students to study locally and at Yasodhara Ashram in Canada, and by sponsoring teaching tours by sanyasins. Our goal is to have a dedicated centre for the teachings in Europe. 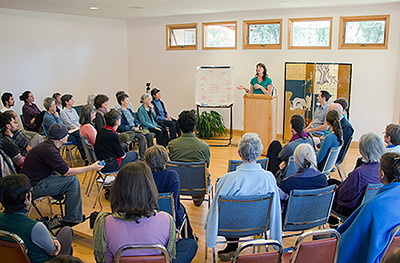 Yasodhara Ashram has been operating since 1963 as a non-profit Society in British Columbia. The Society is a registered Canadian charity and is recognized both provincially and federally as an educational institution. It is operated by volunteers in the tradition of charity and service embodied in its constitution. As a Society our mission does not belong to any individual, but to those who care for it and understand the value of maintaining a sacred space in a world that otherwise pressures us to conform and compete. The Yasodhara Ashram Society stands for ideals that lift us beyond daily survival. By giving to the society, you are saying that you support this vision – a vision of harmony, of Light, of peace among the peoples and religions of the world.